It is approaching dusk in São Paulo, and in the Auditorio Ibirapuera, a grand opera house set amid the sprawling Brazilian metropolis, mayors from around the world are crowding together, taking pictures of one another. In the middle stands Michael R. Bloomberg, the mayor of New York. He is a man who is used to people asking to have their picture taken with him, and he seems very glad to oblige. Time and again, he asks his longtime companion, Diana Taylor, who’s wearing a khaki dress and a sweater tied smartly around her shoulders, to use each person’s camera so he or she might carry home a digitized piece of him. For some time now, observers have questioned whether Bloomberg–who brought unexpected innovation first to the world of financial information and then to the New York City mayor’s office–has another new beginning left in him. By Forbes’s account, he is the 30th richest person in the world, a politician whose ambitions for public office, by his own admission, have reached their end. Close advisers pressed him to run for president in the 2008 election, but as political analyst Larry Sabato recently pointed out, the idea of a Bloomberg 2012 bid, even as an independent, is “a complete nonstarter.” It is also clear that Bloomberg will never return to the day-to-day machinations of the financial services and media company he built, Bloomberg LP. He’s already been there, done that, and moved on. So what comes next? For a man who made his fortune through the fluid dispersal of information, Bloomberg has always been reluctant to talk about himself. That fundamental contradiction is evident in his unwillingness to discuss his own future, publicly or privately. More than a dozen interviews with Bloomberg confidants, colleagues, and advisers–as well as a disarmingly intimate one with Bloomberg himself–reveal no professed master plan. Yet between the lines (and in the details of what he says he won’t do), a vision of the Bloomberg of tomorrow can be glimpsed. The possibilities are vast when you’re a self-made billionaire and world-renowned public figure. But true opportunities for impact and relevance are, it turns out, more limited. In Bloomberg’s view, a better global future is a matter of urban innovation. In many respects, his belief rests on simple logic: When virtually all demographic projections for the coming decades assure us that the vast majority of humanity will soon reside in cities, it makes sense to conclude that our problems and solutions will reside there too. (According to the United Nations, by 2050 the global urban population will rise to about 6 billion, while the rural population will hover around 3 billion.) As Bloomberg sees it, urban innovation depends on mayors with both clear ambitions and autonomy. Also, improvement and measurement are often one and the same. 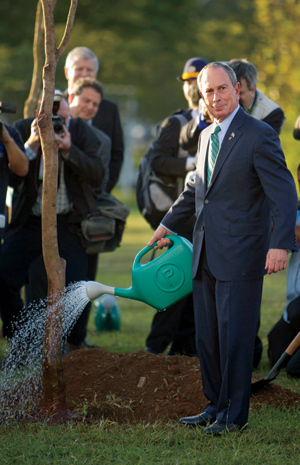 New York, Bloomberg offers by way of example, is halfway to its goal of planting a million trees. The energy needed for air-conditioning has fallen after a citywide program to paint rooftops white, which can reduce energy costs for buildings by between 10% and 50%. He rattles off more facts: Crime has fallen, even with fewer police on the street. After being closed to traffic, Times Square is teeming with tourists at 11 p.m. In conversation in São Paulo, Bloomberg mentions in passing a recent announcement from General Electric about a new thin-film solar panel that reduces the cost of solar power to “not quite the cost of natural gas but almost.” The significance, in his view, is that it would be “enough to start getting competitive, and you could generate a lot of energy within cities.” Dependence on foreign energy sources–or state utilities–could be greatly diminished. Eventually, would cities even need states? Of course, ambition has never been one of Bloomberg’s limitations. During our time in São Paulo, Bloomberg pulls a card from his wallet that he says he carries “just in case” anybody asks what his foundation is working on. There are five things written on the card, and he ticks them off one by one: “public health, the arts, government innovation, the environment, and education.” Needless to say, that’s a lot. Last year, according to The Chronicle of Philanthropy, Bloomberg ranked second among all Americans in total giving–donating $279.2 million to groups that include the Alliance for Young Artists & Writers, the Natural Resources Defense Council, and the Metropolitan Opera Association. He has received high altruistic marks for this largess, but his philanthropic activities are surrounded by the kind of secrecy that has defined his life both in business and as mayor. “It’s really hard to see the philosophical underpinnings of the grant giving,” says Palmer. In the past, Bloomberg has been unwilling to specify how much he has given to each beneficiary or whether any conditions exist for the gifts. His family foundation on Manhattan’s Upper East Side does not even have a publicized address. What Bloomberg makes clear in our discussions, though, is that his foundation will play a major part in his future endeavors. “What our foundation’s trying to do,” Bloomberg explains to me, “is fund things nobody else is interested in. So smoking cessation–I’ve given [about] $65 million a year, with a six-year commitment. Smoking will kill a billion people this century. It’s an enormous thing.” His support of C40 is yet another example, one that may bear additional philanthropic fruit. In New York, he’s used the mayor’s office as a bully pulpit to help raise money for not-for-profits and he’s also deployed the Mayor’s Fund to Advance New York City to garner millions from private donors for public projects the city can’t afford on its own. (In mid-July, Bloomberg gave $24 million to five U.S. cities to help mayors create “Innovation Delivery Teams” that can deliver vital city services amid pressing financial circumstances.) 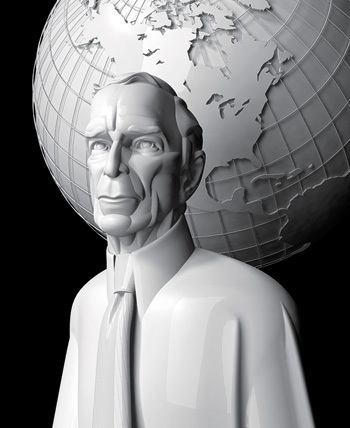 “Private philanthropy cannot replace public expenditures on the big things,” Bloomberg says. New York City’s whole budget is about $66 billion annually. “Even Gates-Buffett doesn’t give away that kind of money.” On the other hand, he adds, private philanthropy can do some important, even radical, things. 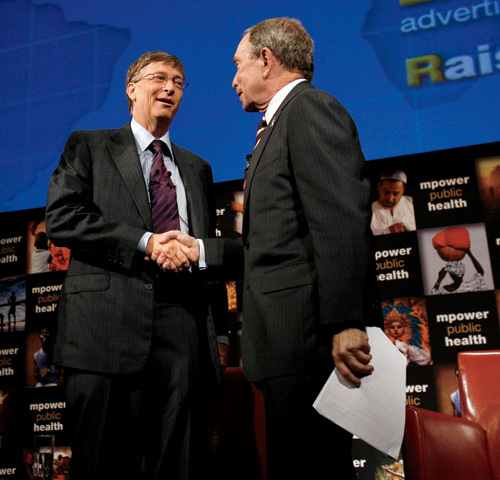 Bloomberg seems almost eager to demonstrate that by marrying his vision of private-sector efficiency with philanthropy, he can eclipse the impact of Gates. “Nobody knows why people die in Africa,” Bloomberg says. “There are no good statistics. We allocate a disproportionate amount of resources to certain diseases that catch the public’s fancy. Dengue fever is not something on people’s list. It kills a lot of people. Malaria is not something on people’s list. It kills a lot of people. Why? Because there is no malaria in the Western world. We drained all the swamps, got rid of the mosquitoes, and so there’s no malaria. But we’ve done nothing to cure it. While Bloomberg may not become the biggest philanthropist in the world, he’s set his sights on being the canniest and most effective. Then there are the LP’s new and expanding web-based products for nontraders, particularly the Bloomberg Government site bgov.com. Launched a year ago and already boasting a staff of 260, BGov provides reporting and data on Washington, D.C., agencies and lobbyists, bureaucrats, and elected officials. The business is geared to both feed new info to terminal customers and sell direct subscriptions, which at $5,700 per year would yield about $300 million in revenue with 50,000 subscribers (the company will not disclose its target). BGov will also, of course, extend the reach, reputation, and influence of all things Bloomberg, especially Bloomberg himself, in our nation’s capital. Changing the world, as everyone knows, takes time. But then, that’s another thing Mike Bloomberg disagrees with.